Elizabeth Julia Georgiana Burrell was by anyone's estimation, a good catch. Her father Peter was the 1st Baron Gwydyr and her mother Priscilla the Baroness Willoughby de Eresby. True, at the age of 33 she was perilously near to remaining on the shelf but both Elizabeth and John had an interest in the arts and all in all it was likely to be a good match. What exactly went wrong was swept discretely under the carpet. Converting to Catholicism in 1841 Elizabeth devoted herself to doing good works on a grand scale. She also fell, not so secretly, in love. A marriage by special licence suggests an urgency on the part of the lovers to be together. Perhaps they must soon part; perhaps an unplanned pregnancy has hastened the decision. On the other hand, the opposite might be true. Perhaps there is no pleasure in the thought of a wedding and it only takes place when the couple are bullied into acquiescence. In the case of John and Elizabeth it seems that there was no great hurry to tie the knot.Nevertheless the prospect of Elizabeth's £30,000+ fortune must have been mouth watering to a man who was struggling to maintain his estates in Limerick. He had been to Harrow and Christ Church Oxford emerging with a degree whereas Elizabeth came to the marriage with an MA earned in 1819. Both mature, they may have shared a mutual interest in art and culture. What could go wrong? Clare it seems, welcomed the poet's attention and their relationship continued.. . The marriage did not last long and in 1829 the Countess moved south "for the benefit of her health," to the newly fashionable seaside resort of Sandown. Here she stayed at the Royal Cliff House..Later she took an apartment at no 4 Brigstocke Terrace, a prestigious new development in Ryde. Her arrival on the isle of Wight was certainly in response to the growing scandal concerning her husband and Byron. It seemed expedient that the Earl absent himself and in 1831 he set off for Bombay as governor. . Unfortunately for the countess she was regarded with disapproval, not only because by association her husband's reputation preceded her but perversely, her failure to stand by him and accompany him abroad was regarded as un-wifely. By dint of her wealth she began to involve herself in the welfare of the town, making donations and supporting good causes. She was soon viewed as the major benefactress. In the early 1840s Elizabeth set out on a grand tour, Her ultimate destination was Italy and here she formally converted to Catholicism entering the Roman Catholic church at St Peters. She arrived home bursting with zeal and began to make plans for the welfare of Catholics living on the Isle of Wight and elsewhere. She commissioned the building of a Catholic church for Ryde to stand in the High Street. The architect was Joseph Hanson, still remembered for the Hanson cab, while the builders were the local firm of Dashwood. Named The Catholic Church of the Sorrowful and Immaculate Mary, it was completed in 1848, liberally decorated with murals and stained glass windows. The tower sported a carillon of bells, rung in formation to inform the faithful which feast day was being celebrated. At some point, Elizabeth made the acquaintance of a young woman named Charlotte Elliot. it was a true meeting of ideas, of religious passion and mutual commitment. The Isle of Wight Observer, in its "Fashionable List" reported on the important people who were staying in the town. This regularly included "The Countess of Clare and Miss Elliot." Miss Elliott's romantic nature is revealed in her wish not to waste money on her funeral: "let the sun and the moon and the stars shine, let the wild birds sing and let the wild flowers grow..." . Any money saved was to be used to help the poor.They therefore planned their final resting place in the new cemetery of Mountjoy within sight of their latest project, Carisbrooke Priory..
Work on the priory started in 1865. By the following year, preparations were made to receive a community of nuns from a closed order in Lancashire. One was already 84 years old and a second described as "aged and blind." They arrived at Cowes in December and things did not go quite as planned, the Isle of Wight Observer reporting that they were "mobbed" owing to defective police arrangements. In 1861 this happy state of affairs came to an end when,on November 6 Miss Elliot died. Charlotte's wish that there shouldn't be a fuss was not entirely observed. Some idea of the ceremony can be gleaned from the death of the Countess some 18 years later as her last wish was for the observances to be identical to that of her friend. The Isle of Wight Observer issued a detailed report.describing how the deceased was laid in state at Brigstoke Terrace so that local people who had benefited from her charity could gaze on the face for a last time. The body was placed in a shell, encased in lead and then enclosed in a rich oak coffin strewn with wreaths. It was then carried from the house to the church by eight strong men where a catafalque had been prepared, draped in black and gold. Here, a service took place and the body rested overnight. The following morning, a requiem mass was held and then the deceased, accompanied by two coach loads of priests and two coaches bearing selected mourners traveled to the cemetery at Mountjoy. At the cemetery gate they were met by a choir and went in procession to the graveside. where Miss Elliot was placed in a stone vault with an adjoining place for Elizabeth. A glass plate was installed between the graves. On the first anniversaryof her passing, at St Marie's Church Millbank, a memorial service was held. The church was hung with black cloth to give solemnity to the occasion while the day before, the Office of the Dead was chanted and at 8.o'clock a procession left the vestry headed by he pastor of the church and acolytes, plus the choir in their surplices, several priests and the bishop of Southwark. The following day the Bishop sang Mass to a huge congregation "which may be expected considering the great esteem the lamented lady was held in." A yearly commemoration followed and at St Mary's, a plaque, some 2' x 4' was installed in white marble inlaid with brass. it featured the "kneeling figure ...in the attitude of prayer before the cross,[and] represents the precise position she was in when death called her away.'. Elizabeth died in 1879 and as decreed, the funeral mirrored that of Charlotte. At the cemetery, the invited guests were permitted to descend the steps into the vault to view Miss Elliot's grave before the Countess was placed beside her,. From the windows in the adjoining priory, the nuns watched the interment. In her lifetime, the Countess made donatons to many local people and causes. She contributed to the building of the hospital at Ryde and opened a Catholic school, now the parish hall. She also financed a Catholiic church at Croydon. 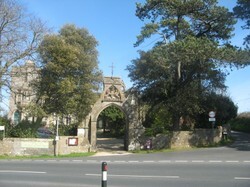 The priory, St Dominic's, continued until 1989 when the last of the nuns departed. It is now run by the Carisbrooke Priory Trust and is open to everyone to use the chapel, visit the gardens or take refreshments. Quite a long article but every word worthwhile. Really enjoyable and I've gained another insight into the fascinating Lord Byron. I often wonder how or where you come across the characters you write about, Jan. You could do an article some time telling us how you research your subjects.